This is a decent deal if you have non-credit cards debts (i.e. a loan or overdraft) and want to switch them to a 0% credit card. 37 months interest-free for money transfers (MT fee 3.45%). Purchases are charged at 19.9% APR. You need to make the transfers within 60 days of account opening to get the 37/24 months interest-free. 3.45% is obviously quite a high fee to transfer your balance – it means a £1000 transfer will cost £34.50. However, money transfer cards generally come with higher fees than balance transfer cards and it’s nigh on impossible to find a money transfer card with zero fee (although happy to be corrected if anyone can find one). Money transfer cards are useful as they allow you to switch non-credit card debts to a 0% card (balance transfer cards only accept switches from other credit cards) so they can be a good tool if you’re paying a high rate on an overdraft or loan. 37 months is not quite the longest money transfer interest-free period – it’s beaten by Tesco Bank Clubcard Credit Card for Money Transfers Mastercard which has 38 months at 0%. As I said 37 months is almost the longest money transfer 0% deal and is only beaten by Tesco which is 38 months and has a higher fee. The fact the card also offers 24 months 0% on balance transfers means it might be a decent option for someone with both credit card debts and an overdraft who really wants to get a grip on their debts. With the money transfer. Can you just transfer the money to you bank account and essentially have an interest free loan? Then if needed just pay off the credit card from you bank account if needed. Pretty much. Well, if you consider the 3.45-4% (basic bracket of acceptance) as interest free. I got a Virgin CC deal not long ago for 38 months. They gave me a £7000 money transfer for around 3% one-off fee. Better than any personal loan out there. With the money transfer. Can you just transfer the money to you bank …With the money transfer. Can you just transfer the money to you bank account and essentially have an interest free loan? Then if needed just pay off the credit card from you bank account if needed. Yes, I did this to buy a car a while back, and paid it back slowly over the 3 years. There will be the 3.45% of the amount of money transferred upfront. Great deal. 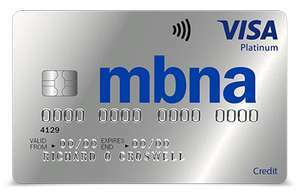 I've been a customer with MBNA for 7+ years. Has anyone tried ringing them to see if this can be applied to your existing account? Yes, that's basically how they work.